Experience the thrill of flying 300 feet over the crystal clear waters of Key West; a staggering 200+ feet higher than the tallest building. Want to take a dip in the water while you're flying, or maybe you want to stay dry? Either can be arranged. When you arrive at the dock, be sure ask about the GoPro video or pictures of your flight that can be purchased. We also have FREE beer and water on the boat! 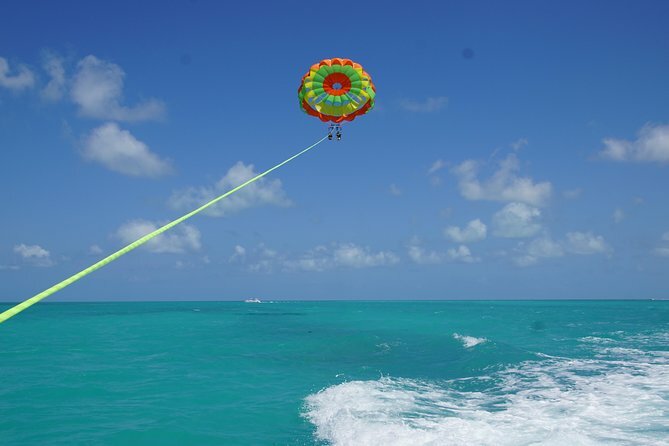 We're the only owner/operated parasailing company in Key West, FL. Experience the thrill of flying 300 feet over the crystal clear waters of Key West; a staggering 200+ feet higher than the tallest building. Want to take a dip in the water while you're flying, or maybe you want to stay dry? Either can be arranged. When you arrive at the dock, be sure ask about the GoPro video or pictures of your flight that can be purchased. The only owner/operated parasailing company in Key West, FL. Experience the thrill of flying 300 feet over the crystal clear waters of Key West; a staggering 200+ feet higher than the tallest building. Want to take a dip in the water while you're flying, or maybe you want to stay dry? Either can be arranged. When you arrive at the dock, be sure ask about the GoPro video or pictures of your flight that can be purchased. The only owner/operated parasailing rig in Key West, FL. For more than a decade, Captain Alfons and Captain Larry have been flying excited visitors high above the emerald isle. Check-in required 30 minutes before departure time.